Of all the natural bristle brushes, this is our absolute favorite. The natural bristles of this hairbrush are fine and strong which enables the brush to grip the hair and clean it smoothly and gently. It is great tool to use in between washings to move the hair’s natural oils away from the scalp. It is also gentle and effective to use on wet hair to help the hair to dry less frizzy. 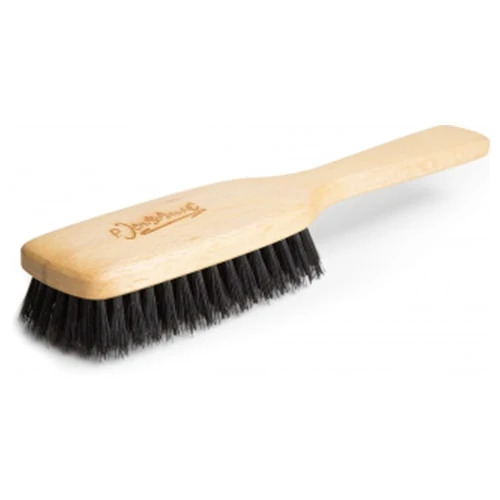 Avoid soaking your wood brush in water to avoid swelling and splitting. Jojoba oil and coconut oil are beautiful for cleaning and conditioning them. Using a soft, absorbent cloth, wipe away any remaining oil. If there is buildup from hair products on the comb, use a retired toothbrush to gently scrub it away.